We analyze the efficiency of organic pasture farming in Germany using data from 1994/95 to 2005/06. Five inputs and one output are analyzed by means of a stochastic frontier production function, allowing for heteroscedasticity and technical effects. Five sets of possible determinants of technical efficiency are considered in the model. These include: (1) farm structure and resources; (2) human capital and management capacities; (3) institutional choice; and (4) subsidies. To these factors that are commonly included in technical effects models, we add (5) a set of variables that capture localization and urbanization economies such as the share of organic farms in a region and the regional share of votes for the Green Party in recent elections. These regional effects are found to have a significant impact on the technical efficiency of organic farms. We have identified 15 production clusters in Germany with different levels of efficiency. Interestingly, especially the southern clusters perform extremely well. In contrast to this, farms in northern and eastern Germany show lower efficiency level. There might be some shortcomings: Hessen, Mecklenburg-Vorpommern and Schleswig-Holstein are not represented in the data-set and in Eastern Germany has only few observations. In the context of Stochastic Frontier Analysis, we might also conclude, that the production frontier is mainly defined by rather small farms which can be found in Southern Germany. However, to our best knowledge, this is the first formal approach to investigate the relation of regional clusters and efficiency levels by a admittedly simple approach. In our study we also investigate the evolution of efficiency on farms that are converting from conventional to organic farming. According to this result, the conversion period is longer than the usual 2 or 5 years, in which the federal states provide support for converting farms. After 6-11 years the average technical efficiency is substantially increasing almost reaching the average level of established farms. A conclusion might be, that farmers need to calculate with a longer adaptation period and from a political point of view, it might be appropriate to support 5 and not 2 years. But this has of course some trade-offs. And the literature also shows, that market-integration of converted farms is crucial for a successful conversion to organic farms. Organic farming is a growing sector not only in Europe in North America, but also on the global level. The system of organic agriculture has the objective to protect the environment and achieve a sustainable farming system. It has been shown in many study-cases, that organic farming often provides a number of advantages for the environment like lower levels of nutrient runoff and a higher level of biodiversity. 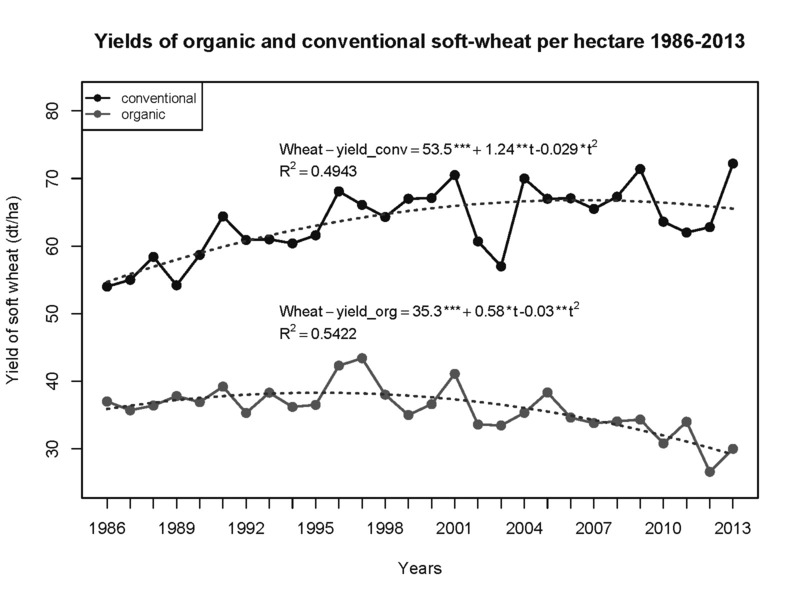 However, in practise we can also observe, that organic farming often comes with lower yields. At the same times, higher prices are necessary to make the system pay economically viable. We want to discuss, whether organic farming is a useful instrument to develop agriculture in developing countries in Sub-Saharan Africa, South-East Asia and Latin America. Most of farmers in developing countries are small subsistence and semi-subsistence farmers, therefore organic farming might provide interesting examples to help farmers in those countries to improve their income. Besides this, we can observe that agriculture in ecological sensitive areas can be a challenge. On the other hand, according the report “how to feed the world 2050” from the Food and Agricultural Organization (FAO) we need to increase the food-production by 70% until the year 2050. The share of people living in extreme poverty nowadays is already at 1.4 Billion persons, the number of persons who are suffering from chronic starvation is estimated by FAO at 870 Million people. Therefore we also need farming systems with constantly high yields in order to supply international markets and contribute on the world food situation. In that respect, organic farming has been sometimes criticized due to it’s lower yields. It might also be an interesting debate, if we can combine organic farming with other strategies and approaches to optimize farming systems in developing countries and at the same time improve yields. But poverty, starvation, small farming and farming in ecologically sensitive areas might also be problems, which are interlinked. We will critically investigate and discuss the role of organic farming for agriculture in developing countries. Dr. Marie von Meyer-Höfer has done her dissertation at University Göttingen on “Product Differentiation and Consumer Preferences for Sustainable Food“. Her main research interests are food consumer research, sustainable and organic food consumption in industrialized and emerging countries, sustainability labelling and animal welfare. Viola von Cramon-Taubadel studied agricultural economics at the University in Bonn. She is politician for the Green Party in Germany and has been member of the Bundestag 2009-2013. She is working on foreign policy and human rights in Eastern Europe (mainly Ukraine), but she also brings a wide expertise on agriculture in Eastern Europe. Prof. Dr. Matin Qaim has done his PhD in Kiel and Bonn. Since 2007 he is professor for “International Food Economics and Rural Development” at the University Göttingen. Since then he has supervised many PhD-students, he has an outstanding publication record, he has won many scientific awards and he has a wide expertise in developing countries. His main research interests are the economics of biotechnology, issues of food security and sustainable development, nutrition and health economics, agricultural markets of high value products in developing countries and rural development. Eberhard Prunzel-Ulrich has studied agriculture at Göttingen University. In 1981 he and his wife founded his small farm in Landolfshausen (Käsehof Landolfshausen) some km from Göttingen, which since 1987 he runs under the Bioland-certification. They mainly produce grain, and milk & cheese from sheep and goats, which they sell on the weekly market in Göttingen. Since many years, they are also in involved in education-projects like farm-courses for children or guided tours and open-farm events. Eberhard Prunzel-Ulrich is also involved in activities of the small-farmers association in Lower Saxony. Jan Fragel: studied law and education science in Göttingen. He is a freelancer journalist working for print media and radio, who also brings many experiences on agricultural and development topics especially in developing countries like e.g. Nicaragua or Thailand. The discussion is part of the accompanying program of the DAAD-Biofach Winterschool, which takes place in Göttingen and Nuremberg between February 2-14, 2016 and which is organized by the Section for Tropical and Subtropical Agriculture and Forestry (SeTSAF) (Antje Henkelmann) of the Georg-August University Göttingen and which is supported by the German Academic Exchange Service (DAAD). On August 9th, 2015 starts the International Congress of Agricultural Economists (ICAE) in Milano, Italy. On Thursday, August 13, 11-12:30 o’clock (Malliani Room 70) we will discuss topics of efficiency and productivity of organic farming systems together with some of the most specialized and experienced scientists in the field. Markets for organic farming have been constantly growing during the last twenty years, however, in some established countries like Germany, Austria or Denmark we can observe, that the number of farmers who convert to organic farming is stagnating or declining. In 2014, for the first time, the organic area in Germany has been slightly decreasing with a lot of press-echo. So journalists have already announced the organic crisis 3.0, which is a bit overdone from my point of view. But the fact is there and it might be interesting to discuss, why this is the case. The scientific and public debate in Germany about the reasons for farmers being reluctant to become organic has been focused on the question, whether organic farmers are systematically disadvantaged on the land-markets, because their conventional neighbors might receive additional support for their biogas-plant. The debate is just ignoring, that not every conventional farmer has a biogas-plant, that the market for land are quite different among different regions. There is so far no empirical proof that problems on the land-market are a problem for all organic farmers. Also the system of subsidization of organic farms has been questioned. But if this would have been the main issue, the number of new organic farmers must have exploded in 2014, since almost all German federal states announced higher support rates for organic farming. How about efficiency and productivity? There are a few details on these data we need to consider, before we get too critical with organic farming as a system. 1.) Organic farming tend to work on less favorable locations and therefore achieve lower yields. So a part of the difference is a systematic difference. 2.) 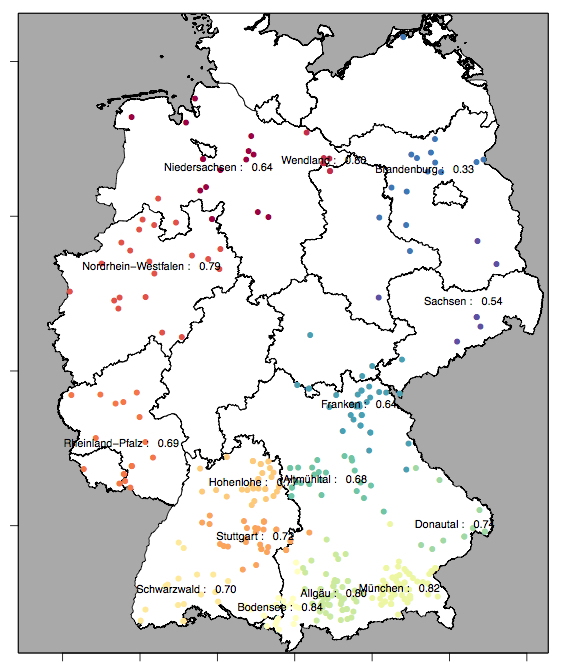 The data-set on organic farms have changed throughout the years: Especially in the years between 1994 and 2000 the data-set has been extended to East Germany, which substantially changed the sample. 3.) A lot of organic farms are milk- and grassland-farms, whereas in comparison to conventional farming, the share of arable farms is lower. This might explain the difference in wheat and it might also explain, why a similar graph for milk-yields looks much more parallel. But this is not the point here. What is so striking, is the missing yield-growth of wheat! So if farmers convert to organic farming, they might face limits. 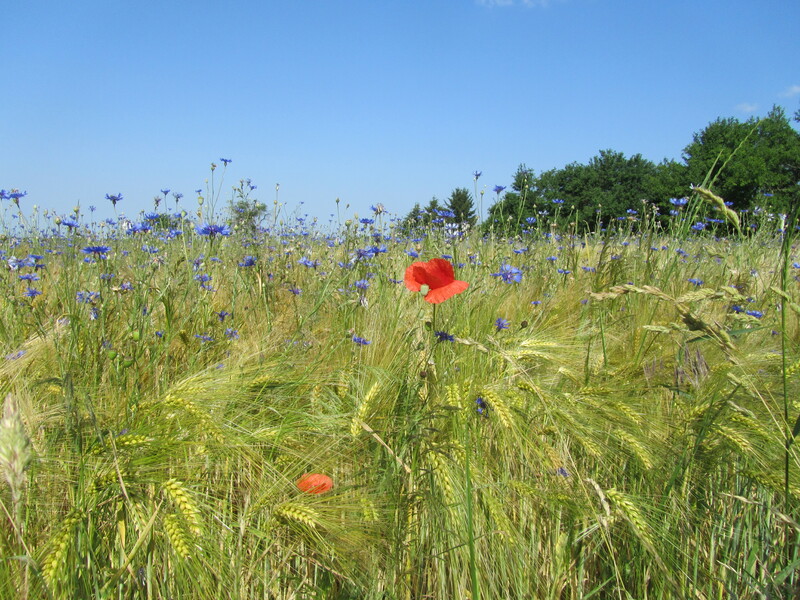 Obviously the wheat-varieties do not grow to the same extent that in conventional farming. So one conclusion, without any discussion might be, that there is too little done in adjusting wheat-varieties to the system of organic farming. 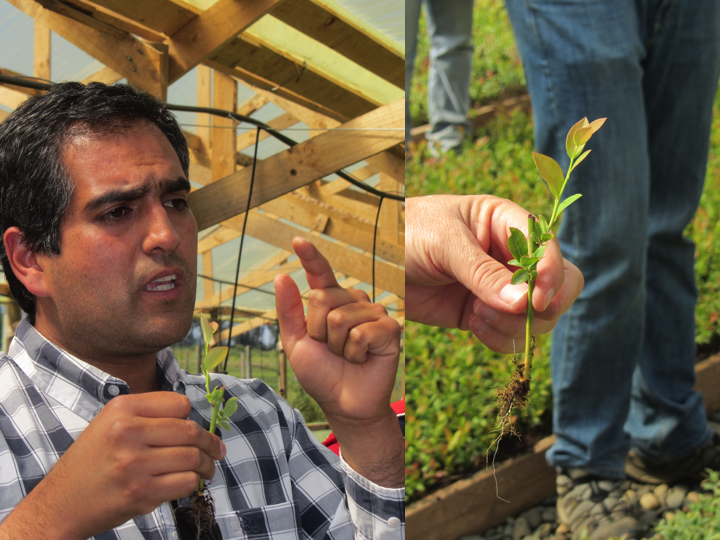 Breeding varieties is a costly and a very difficult business, therefore firms might sometimes be (too?) reluctant to work 10 years on new breeds for organic farming. So this might be a task for public support in science? According to Felix Prinz zu Löwenstein, chairmen of German Federation of the Organic Food Industry (BÖLW) innovation, research, development and extension is one of the main topics to further develop organic farming. So I hope we can contribute a bit to the topic. On the other hand, the lower yields come together with an good environmental performance. Do farmers have to accept lower yields because society wants environmental sound farming practices? How can we include the environmental dimension of organic farming into classical ag-economics modeling? – What are the main conclusions from efficiency analysis? – What are methodological challenges.? – Which are conclusions for agricultural policy? – Where are links for interdisciplinary cooperation? The introductory presentation provides an overview on the literature on efficiency and productivity of organic farming. We can distinguish between studies that aim to compare conventional and organic farming systems and studies that concentrate of specific problems of the organic sector. Sample selection issues are a major challenge in farm system-comparisons. The efficiency results are very heterogeneous depending from model set up, data set and background of the study. Some of the studies also show, that the conversion to organic farming is influenced by inefficiency. In three of four studies, organic farms have a lower productivity than conventional farms. The degree of specialization on organic farms is not optimal, however the limits of specialization for organic farms are not discussed. Studies on environmental efficiency show organic farming is more efficient when the environmental dimension is taken into account. Some studies also model the impact of subsidies on farm’s efficiency. Technical efficiency of farms under conventional agriculture determines whether farms convert to organic or remain in conventional farming. Efficient farms may be more capable of adopting new technologies and therefore convert to organic farming. By contrast, choosing to produce for the organic niche market may be a survival strategy for technically inefficient conventional farms. A study on French crop farms investigates technical efficiency during the years preceding conversion in order to predict the probability of conversion. The results show an influence of technical efficiency of (conventional) farms on the probability to convert to organic farming, but that the direction depends on farm-size and production-type. Another study on dairy farms from North West France considers the effect of (past) technological change on the decision to convert. Results show that dairy farms switching to organic farming show a higher efficiency in conventional farming, but experienced a slowdown in efficiency the year before conversion. Organic farms work under very heterogeneous natural-site and socio-economic conditions. This heterogeneity is of clear relevance for economic efficiency and for the decision of farms to convert to organic farming. In order to produce proper results efficiency analysis must consider such heterogeneity and self-selection aspects. This applies in particular to data envelopment analysis, since this technique does not calculate error terms, but include heterogeneity into efficiency results. One way to control for such effects is matching. Matching is based on the assumption that under a given vector of observable variables, the outcome of one individual is independent of the adoption of a specific treatment. In our paper we present how to implement matching into efficiency analysis of organic farms. We give a brief overview on literature applying this technique and we discuss which insights the application of matching might contribute to the current discussion on organic farming. This study examined the response of the Ghanaian pineapple production sector to the 2004/05 crisis where a swift shift of international market demand from the traditional smooth cayenne and sugar loaf variety to MD2 variety almost destroyed the entire fruit industry. Seven years after the crisis, we studied how Ghanaian pineapple farmers have responded to international market demand. We estimated the proportion of our sampled farmers cultivating the MD2 variety and analysed the factors influencing adoption of the MD2 variety using a logistic regression model. We employed metafrontier analytical techniques to assess the current productivity level of organic and conventional pineapple producers using a cross sectional data set gathered from 404 farm-households in three regions where commercial production is most concentrated. The results of our analysis reveal that, the majority of farmers in both organic and conventional production systems was operating quite near their group frontier as well as the industrial frontier. So if you found that interesting, feel free to visit our Symposium! It’s on Thursday, 13/Aug/2015: 11:00am – 12:30pm, Malliani Room 70.